"Red wine gives me a headache. I must be allergic to sulfites." But sulfites do not cause red wine headaches. And you know what? On average, white wines have more sulfites than red wines. So does dried fruit. 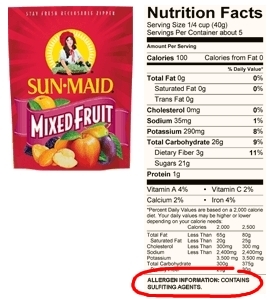 If you can eat raisins, you are not allergic to sulfites. If you can drink white wine, you are not allergic to sulfites. So what causes your red wine headaches? I'm sorry, but I don't know. Even if you do weeks of expensive allergy testing, you might not find out. Red wine is a fermented product of grapes and grape skins that's a soup of (mostly) naturally occurring chemicals. You might be intolerant -- not truly allergic -- of any of them. Headaches are not caused by true food allergies. Your symptoms are real; I don't doubt that for a moment, because I'm intolerant of tomatoes, and I get pissed off at the occasional person who suggests it's all in my head. Tomatoes give me gastrointestinal symptoms and, in high doses I'm smart enough to not eat anymore, hives -- but not headaches. You might be intolerant of sulfites; that's possible. But let's get back to that white wine/red wine comparison. White wines on average contain more sulfites than red wines. So you are not allergic to sulfites. I've heard this story dozens of times: "But I was in Europe and I could drink red wines there without a problem. And they don't say 'Contains sulfites' on the label." That's true, but the reason is that US law requires the sulfite disclosure on wine, and EU law doesn't. More than 99% of European wines contain added sulfites, just like US wines, and the levels aren't different on average. I'm sorry, I don't know why you can drink wine in Europe and not here. Maybe you're not stressed over there. Don't ignore the alcohol percentage, which is generally lower over there. If you can drink some wines but others make you feel ill, then don't drink the wines that make you feel ill. But you are not allergic to sulfites. Blake, since November 2005 wines sold in EU must have the "contains sulfites" warning (and in many languages, so it takes a lot of the back label space) if they contain more than 10 parts per million, so people claiming they don't get headaches in Europe might have been drinking only older vintages. In fact I know a guy who claims that he does not get a headache only if he drinks a wine that is at least 10 years old. Good on you, Blake. Maybe if enough voices speak up about this nonsense people will start to get it. I put up a similar piece back in 2006, and it is still pulling several comments a month from sputtering crackpots insisting that they are allergic to sulfites. Sean: That's a really interesting story. Have you tried to isolate other variables? What price ranges are we talking about? This is a generalization but I think a fair one: Cheap wines go through more processing in the winery, and are more likely to have more additives. They're also more likely to have more chemicals applied in the vineyard, because hand-farming with low pesticide/herbicide use is expensive. You could be reacting to one of many, many things. The "sulfite allergy sufferers" remind me of the vaccine avoiders. No matter how much evidence they are presented proving the contrary is true, they continue in their beliefs. Blake, May I print a copy of this story for visitors to my tasting room? I say much the same thing, and it would be nice to follow up with your article. John: Please do, though please ensure that my blog title is on the printout. That way I'll get visits from the angry dissenters, and what the hell, readers are readers. Katherine: That's a can of parasites. Fortunately, people who misunderstand their red wine headaches aren't putting the rest of us at risk. Blake: The only variable for me seems to be quality/price. I initially thought it might have been old world vs. new world wines. Most of my early wine experience was limited to relatively inexpensive ($10 to $15) Chilean, South African and Australian wines. I started drinking better wine ($25 to $35 range) about two years ago primarily from France and Italy, and my headaches were a thing of the past. However, at the insistence of my local wine pusher…I mean merchant, I tried a few wines from the US and Australia at a higher price point than my earlier samplings and thoroughly enjoyed them without the nasty headaches. PS – Now that I can drink wine without fear of a cranial implosion, I enjoy reading and researching wine related topics ALMOST as much as I enjoy actually drinking wine. I find your blog to be insightful, informative, and entertaining. Keep up the great work. Thank you, Sean, that makes my day! I'm glad to hear your solution to the headache problem was so simple. Unfortunately, even if you had unlimited time and money, and an unlimited capacity to give yourself headaches for scientific purposes, you couldn't use your data to figure out what actually causes you problems, because wineries are never going to give out complete lists of all the commercial yeast, enzymes, wood chips, etc etc that they might have thrown into those products. But anybody reading the comments this far because they also get red-wine headaches should give your method a try. I am convinced that it is the use of lower quality oak, or oak chips, specifically from American oak species, which cause red wine headaches for most people. Higher quality wines use real oak barrels, and wines from Europe obviously have European oak species for their oak barrel aging. There is some substance or group of substances in lower quality American oak that cause headaches. Thank you! This is one of those food myths that just drive be up the wall. I think the real problem is drinking too much red wine. In other words, people are "allergic" to hangovers. Hi Blake, I agree with the view that headaches are caused by a combination of the price/quality of the wine and the quantity of alcohol ingested! I thought it was common knowledge that there were more sulfites in white wine (and in dried fruits, and other processed foods) but it would seem not! The "sulfites cause headaches" thing is a bit of an urban legend! Anecdotal evidence aside, the most recent research I’ve read seems to conclude that the most likely culprits are bi-products of malolactic fermentation, in particular biogenic amines, such as histamine and tyramine. This makes perfect sense to me, since I typically get headaches from red wines and Chardonnay. Virtually every red wine goes through malolactic fermentation, as do many Chardonnays. I’ve begun asking everyone I meet, which wines most often give them headaches and, so far, the answer has invariably been red wines and some Chardonnays. As to the quality of the wine, I have had more than one doozy of a headache from very expensive wines, sometimes even when spitting. Conversely, I’ve had no ill effects from countless inexpensive wines. It’s my understanding that researchers are attempting to develop yeasts which can not only initiate primary, alcoholic fermentation, but also replace the bacteria normally used to initiate secondary, malolactic fermentation. Since it is the action of the bacteria used which results in the creation biogenic amines, it is thought that a yeast-initiated malolactic fermentation would eliminate the inducement of headaches. Headaches are NOT an allergic response. More likely the vasoactive effect of alcohol is more of a factor. People have claimed oak-derived substances and biogenic amines as the culprits. Glycoproteins are more likely to cause allergic reactions but not headaches. I agree with the general conclusion that sulfites are not responsible for the headaches associated with certain wines among certain subsets of wine consumers. However there are a multitude of compounds that can elicit a physiological response in wine. The Biogenic amines (including histamine from certain lactobacillus and pediococcus species) do have pressor activity and can cause blood vessel constriction and could be a causitive agent in the headache syndrome. However other compounds also have physiological activity, i.e. tannins can dilate blood vessels and lower blood pressure. Additionally, there is evidence that tannins affect the serotonin balance in the brain and could be elicitors of migraines. As red wines age, those tannins polymerize and could conceivably become less bio-active. Additionally, wines made from riper grapes (new-world style) have higher concentrations of longer-chain alcohols which are de-toxified through a different and more general alcohol dehydrogenase system than ethyl alcohol So, to sum it up, no one really knows why wine causes headaches. But don't let that get in your way of a great cabernet. just keep tasting until you find one that you like and doesn't affect you adversely. I don't drink wine, red or white, because on the four occasions I have I succumbed to severe headaches. I don't know why, lots of people have suggested the sulfite theory to me. I shrug it off and explain that I don't know why wine doesn't seem to agree with me, but it doesn't. I love the intolerance vs. allergy comparison though - I hear a lot of people incorrectly say they have food allergies, when all it is is apparent intolerance. My solution to the wine gives me headaches problem? I don't drink wine. Strangely, I can drink beer just fine. And I enjoy it. Am with CWP on Glycoproteins, which have been identified as very close in structure to those which cause 'rag-weed' allergen responses. So, SUAMW, to parry your point, "Glycoproteins are more likely to cause allergic reactions but not headaches", having experienced them myself, a sinus histamine reaction to allergens, can most certainly elicit a headache. The cause and effect chain is likely longer than a single link. I love food and I love flavors and related to that, I love wines (and other alcoholic beverages) and tasting. Wine tasting, on the other hand, doesn't really seem to agree with me. I DO get headaches like so many other people report (and along with it, fatigue and shortness of breath), but it's from ALL manners of ingestable alcohol (it really doesn't seem to matter if it's wine, beer, whiskey, or some other liquor) and in small doses and I ALSO experience immediate flushing and -hives- that are mostly centered on my face. Obviously, I shouldn't be drinking anything - especially with the hives, but like I said, I love foods and flavors and sometimes, I can't help but sample just a little taste (with medication ready, just in case). Interestingly, I am allergic - allergic, allergic - to sulfonamides (if it's in skincare products like sunscreen, I will develop very bad hives even if I immediately wash it off) and I have been tentatively slated for sensitivity towards sulfites (where I don't develop hives, I experience other very unpleasant GI side effects that suggest an intolerance at the least). In terms of food, I am also intolerant to certain proteins in wheat, egg, lactose, fructose, nitrites, and MSG and owing to a genetic blood disorder, I experience an 'allergy' towards fava beans, mothballs, and some other odds and ends that manifests itself as a rather destructive hemolysis of my blood cells. That said, going back to my earlier comment about my reaction to alcohol and my experiences with it, one supposes that headaches, heart palpitations, fatigue, and lightheadedness can all be attributed (in my case, anyways) to my blood disorder which makes me abnormally sensitive to the hemolytic properties of alcohol - even in small doses. The hives, on the other hand, has to do with something else - a histamine reaction to... something that's in potable alcoholic products. Let's not forget one new item that a lot of cheap wines have now. Not oak barrels as they are too expensive, not oak staves as they are expensive to, not oak chips ($$ also) but oak powder. Yes, they are putting oak powder in the cheapie wines now to simulate oak aging. I think they just need to stop and actually let the wine speak for itself without the mask of oak. I suffer from migraines connected directly to sodium metabisulphite in particular, which is in most squash, flavoured vinegars, cider and unfortunately wine. Perhaps others are getting typical headaches confused with migraines, which are caused by a chemical imbalance and not an allergy. Quality does seem to lower my chances of getting one, though. Any ideas why? I agree with Sean. I'm from the US and have primarily drank California wines. Occasionally, I might develop a headache from red wine. I recently moved to Germany and noticed the wines were really, really inexpensive. They taste pretty good; however, the headaches, oh my goodness. Two maybe 3 small glasses and I would develop a "severe" headache that Ibuprofen would not touch. These headaches would last 2 days. My friend here in Germany is experiencing the same thing. That's how I came upon your article. The headache was so intense and so isolated to these new wines I have had in Germany (they were not German wines by the way)that I started to do a little internet research. Sounds like it's not sulfites, although I have been told that organic wines do not cause the headaches. Anyway, I'm going to stick with the more expensive wines or organic wines from now on to see if that helps. I have long experienced allergic symptoms after drinking even small amounts of wine.. Both red and white. Mostly stuffed sinuses, runny nose, sneezing, and headache. I'm clearly not allergic to sulfite a (I can eat large amounts of dried fruit without problems), and previously suspected oak, so recently have consumed only unoaked wines. This isn't always reliable, either. Last year, visiting France, of course I had to drink wine in Provence, I discovered that I could freely drink without any symptoms at all. I got back to the states and now have symptoms drinking the same labels that caused no problems in France! 1. Are there differences in European wines produced for consumption in Europe vs those produced for export to the US? 2. Has any analysis been done that measures the amount of glycoproteins in different wines? Does the amount of glycoproteins vary by age of the wine, geography of origin, or manufacturing process? I don't get headaches, but I do get breathing problems from drinking red wine. As in, I can't breathe. I always used to slightly wheeze, but now it's to the point where I'd be visiting an ER. My allergist said that there really is no way to tell what it is in the red wine that causes issues, like you said it's pretty much a soup of things-tannins, sulphites, grape skins, and mold. There's different strains of things probably from different countries. If you get a headache, then just try a different wine-but it's likely not sulphites. I've read about lipid transfer proteins (from medical journals), that grape skins have a protein similar to the ones that cause allergic reactions in peaches & cherries. If you have a pollen allergy & then Oral Allergy Syndrome to those fruits, it's possible you'll react to red wine. Basically if something doesn't work for you, don't eat/drink it.